There are many different ways to attach custom clothing labels. Sewing labels have a great nostalgic, handmade feel, but iron-on labels are often more convenient and gentler on sensitive skin. If you are really concerned about sensitive skin, though, you may opt for ink transfers that are ironed on. 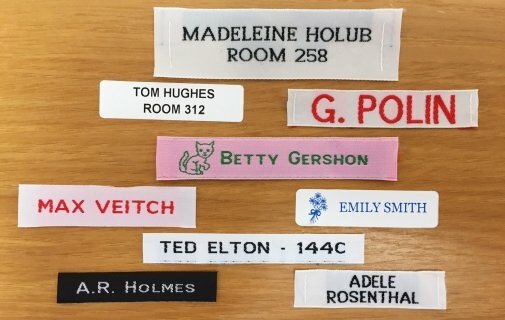 There is a new, convenient tag option available from It’s Mine Labels that is even more useful if you are trying to attach clothing labels to your own clothes or your loved ones’ garments, instead of labeling your own line of clothing. These labels are called Snappy Tags. These labels have experienced great success in England and Europe, and are finally being introduced more widely in the U.S. This innovative product can be applied in seconds with a simple push and click — no extra supplies needed. You start by selecting the color of your snappy tag and the name you want laser-etched onto the snappy tag, which looks like a small button. The snap is then attached directly to the care label or the clothing label through the use of the applicator. The name will not fade or wash off, and the Snappy Tag is durable enough to last through many washes and dry cleaning. If you decide you no longer need the label at some point, it can be removed using the same applicator. They can then be reapplied elsewhere with different backs, making them incredibly cost-effective. The tags can be ordered with as many as three lines of text and 26 characters, total, and are perfect for kids’ summer camp, senior homes, college, hospitals, and more.